Click on a name below to view contact information and bio. An original staff member of the Alliance, Jennifer re-joined the Alliance team in 2015 after working in the insurance industry for four years. While enjoyable, her time in the insurance industry helped Jennifer re-discover her passion for nonprofits. As the Director of Membership, Jennifer plays a vital role in engaging members, connecting them to our benefits, managing many of our discount programs and deepening relationships with our partner member supporters. Jennifer is also a native Arizonan. Angel serves as an AmeriCorps VISTA member assisting in building capacity for the Alliance. In the past eight years, Angel helped grow Borderzine, a nonprofit start-up that has become nationally recognized as a model for increasing diversity in newsrooms. In 2015, he took a year off from his job and traveled the world as a volunteer managing event planning and promotion teams in the U.S., Mexico and Europe for the international nonprofit organization, Up with People. Angel has a BA in Media Advertising and an MBA with a concentration in General Management, both from the University of Texas at El Paso. 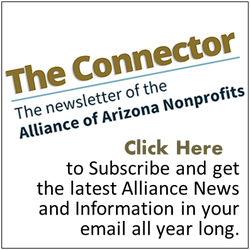 He is most excited to help address the various needs of Arizona’s nonprofit sector. Juan serves as the Alliance's AmeriCorps VISTA Leader, providing support to a team of VISTA members serving at 14 organizations across rural Arizona. After graduating from Humboldt State University with a Bachelors of Science in Environmental Biology, Juan served as an AmeriCorps VISTA at the Ajo Center for Sustainable Agriculture, building the capacity of the Ajo CSA’s Adopt-A-Sonoran-Desert-Crop and Ajo Gardeners Network Programs. In his role as VISTA Leader, Juan enjoys the opportunity for service by contributing to the success of the Alliance VISTA program and all of its members. Prior to joining the Alliance, Robin was with Arizona Citizens for the Arts where she managed the Business Volunteers for the Arts program. She spent over 20 years with Prudential Financial managing their employee volunteer program, sponsorships, and grant funding. She has served on the board of directors for Hands On Greater Phoenix, Phoenix Women’s Sports Association, and the Governor’s Commission on Service and Volunteerism. Robin’s first exposure to the VISTA program was in 1965, when two VISTA volunteers were sent to Parker, AZ, and lived with Robin’s family for their year of service. Kristen is a proven leader across multiple sectors invested in the development and success of others. 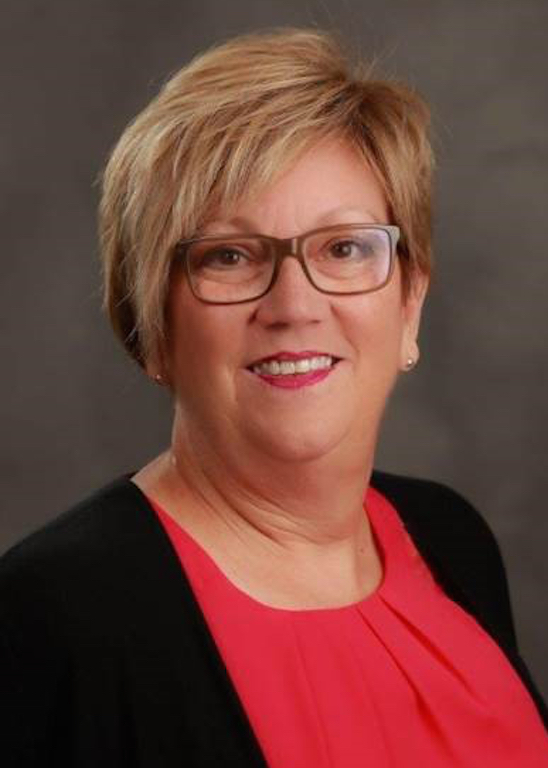 She has more than 16 years’ experience leading efforts to support community stakeholders, including extensive involvement working with professional associations, Chambers of Commerce and various community and business organizations, both public and private. Kristen is a fierce competitor, never satisfied with resting on her laurels and is always looking for the next big challenge to conquer. She is driven to be the best while remaining authentic and invested in the success of others. Wicked smart, calm under pressure, a seasoned leader and skilled communicator, she knows how to solve the big problems and create consensus around complex issues. Her WHY is to be the best version of herself so that she can share her knowledge and experience with others to help them reach their full potential. Kristen is an active volunteer serving on various business and nonprofit community committees and boards. She holds a BS in Business Management from Grand Canyon University; a Certificate in Association Management from ASAE and the prestigious designations of Certified Association Executive (CAE) and Certified Nonprofit Accounting Professional (CNAP). She is also a graduate of the ASU Lodestar Center’s Generation Next Nonprofit Leadership Academy and the ASBA Executive Business Mentoring Program. As Office Manager, Jacki wears several hats, including day-to-day management of the Alliance Member database of over 1,000 organizations. She also processes all incoming payments, manages donor data, and more, while providing outstanding customer service to all of our Member organizations. Before joining the Alliance, Jacki spent six years serving Arizona's homeless community by providing training, help desk support, and database management at HMIS, Homeless Management Information Systems. Before working in the nonprofit world full time, Jacki honed her special skill set in a variety of roles at Shurgard Storage where she was instrumental to the success of several large scale projects, including opening a national sales center for this multi-billion dollar company. The Alliance and its members are definitely lucky to have this "Jacki of all Trades" as part of the team. Jennifer oversees the Alliance’s community outreach efforts including capacity building workshops, educational webinars, annual conference, partnership agreements and fundraising for the organization. She is also responsible for managing the Arizona Gives (AZGives.org) program and Arizona Gives Day, a 24-hour online statewide giving campaign held in April each year. Prior to joining the Alliance, Jennifer was the Community Affairs Manager at BMO Harris Bank where she developed the annual philanthropic strategy and corporate giving program within Arizona, assisted executives with board engagement and built relationships with the nonprofit community. Prior to her Community Affairs position, she held the position of Assistant Vice President - Marketing/Communications. During her 16 years with the bank, Jennifer also organized annual employee volunteer programs, was Chair of its local diversity council and President of the bank’s young professionals group nationwide. Jennifer is a graduate of the Valley Leadership Institute Class 36 and served as Marketing Chair for the Chandler Coalition on Youth Substance Abuse (ICAN) during its inaugural years. Currently, she is an active member of the Monarch Council at the Desert Botanical Garden. The Alliance of Arizona Nonprofits is a proud participant in the Employers of National Service program and encourages other organizations to employ National Service Alumni. For more information visit www.NationalService.gov.